General food etiquette – ie. 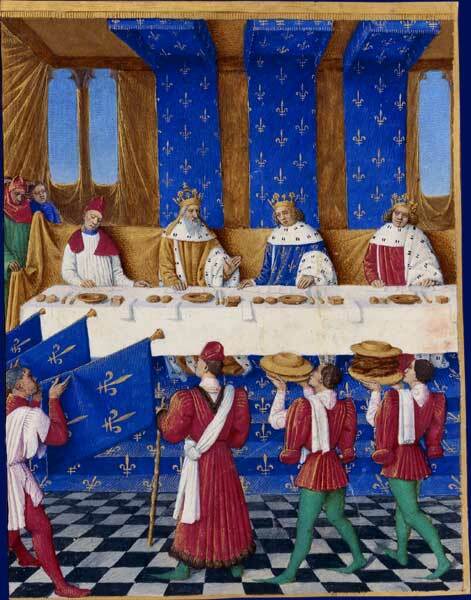 medieval table manners – were very important and getting them right was crucial if a special banquet was to be a success. The extravagant feasts and excesses of the many banquets held in 12th-15th century England and Europe are legendary. For those who had the resources, these occasions would be incredibly opulent affairs. However, they were certainly not a ‘free-for-all’ where everyone invited just ate and drank to excess. Far from it. Good table manners were the order of the day. From the Lord of the manor, his family, friends and guests, even members of royal families, everyone was expected to know and use good table manners. In fact, the worldliness of knights and squires who had travelled far and wide. particularly during the Medieval Crusades, led to a resurgence and pride in maintaining elegant manners and meticulous presentation. There would be beautifully arranged colourful displays of flowers adorning the medieval banquet table and the food served would contain a wide variety of wonderful flavours and spices. The food served at a typical medieval banquet would be chosen and purchased by a squire of the kitchen on behalf of the Lord or the King. The meals prepared would be initially placed on a dresser in the kitchen until it would be taken forth into the Great Hall of the castle and formally presented, often to a musical fanfare from musicians in the minstrel’s gallery. On arrival, guests were generally invited to wash their hands at the entrance to the Great Hall and then they would proceed to be seated so that grace could be said. Buffets were a raked assembly of wooden planks, in effect a series of shelves and the number of the shelf would indicate rank with the highest shelves being reserved for people of the highest rank. Fine plates of gold or silver would be displayed on the buffet and it is from these that servants would serve the food. The number of courses presented at a banquet might vary but for a prestigious occasion there would probably be at least five or six courses; in the case of a lord or king this could actually be up to a dozen. A key point in table manners during the medieval era was that every dish or drink that was consumed by the highest-ranking members of the gathering would first be tasted by a servant to check that it was not poisoned. In truth this became less of a practical consideration and was more a ceremonial ritual.